One of the reactions to my thoughts on Portland’s housing affordability emergency (their label) that I’ve found the most interesting is that my proposal is unworkable, Portland’s residents will never accept even small increases in density in their single-family neighborhoods. Chuck, you don’t understand the level of resistance. Better to get the most density where you can, when you can, and that is at the transit stops. In the Curbside Chat, I talk about the modern definition of a solutions as, “What can someone else change about what they are doing so that I don’t have to change anything about what I am doing?" We’re nearing the end of an insane election cycle where we are once again bombarded with such non-solution solutions. Benjamin Franklin never warned of a democracy where the electorate can vote themselves money, although it makes a good meme. Michael Lewis did suggest, at the end of Boomerang: Travels in the New Third World, that is precisely what we now have. One of the key insights of Strong Towns is that our development pattern functions like a Ponzi scheme. The Suburban Experiment – development built in large blocks to a finished state – provides the illusion of wealth when everything is new and costs are low. In time, things start to go bad and the tragic truth begins to be revealed: that the long term costs of servicing and maintaining these places cannot be met by the wealth they produce. New growth and debt – mistaking insolvency for a cash flow problem – bridge the gap for a while until the growing liabilities overwhelm everything. 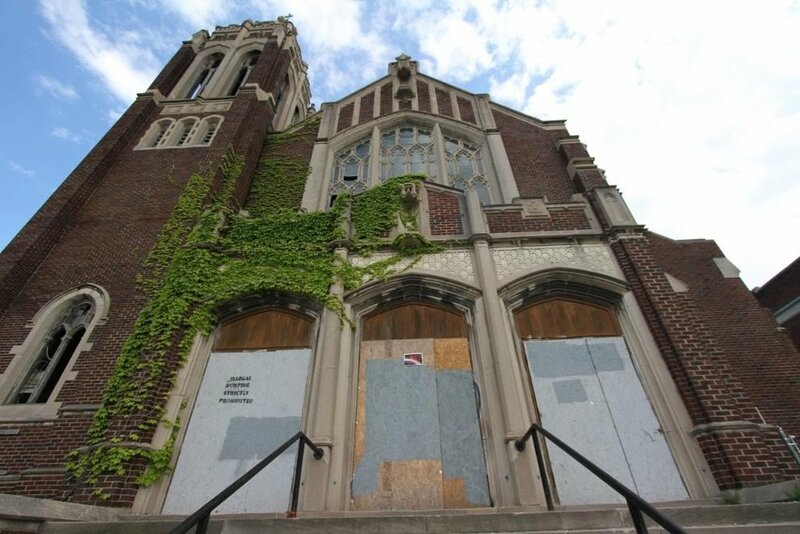 What happens next is an open question, although we can see in places like Detroit – which got started on this experiment a couple of decades before the rest of the continent – one possible outcome. And let me point out to the residents of Portland who believe their financial situation bears no resemblance to Detroit’s, trust me when I say that the people of 1960’s Detroit would believe the same thing about today’s Detroit. The vast majority of the land area in Portland – like practically every other city in North America – is functionally insolvent. That insolvency will come to bear at some point, and to a degree already is, so let’s stop pretending that it won’t. I’ve said many times that the greatest challenge of this generation will be to avoid repeating the mistakes of what has come to be known as “white flight”, the abandonment of large parts of our cities by everyone except the very poor. When we concentrated poverty in our inner cities after World War II, we left people behind in neighborhoods that were largely coherent. That was a tragedy on many levels, but it will be dwarfed by the catastrophe of abandoning poor people on the outskirts of our cities, where even during the best of times, life is despotic for people who can’t afford the high financial burn rate of such a lifestyle. Wait until those big box stores go empty, the drainage ditches and berms are overgrown with weeds and the infrastructure is no longer maintained. Again, Charlie LeDuff’s Detroit: An American Autopsy gives a firsthand account of how this is playing out in one scenario. So please excuse me if I’m not very sympathetic to the notion that change is hard, that people who are comfortable will resist it. Of course they will. Our job as Strong Towns advocates is to find a way through that resistance, to share our message with our friends, neighbors and others in our communities, to keep bringing the conversation back to the persistent fact that our current approach is not working financially. We’re broke and so we must start thinking differently. So I’ve suggested that all neighborhoods – those areas around our transit stops as well as the broad swatch of single family homes – should be allowed, by right, the next level of intensity in their development pattern. But no more. The ability to move to the next increment is to allow neighborhoods to mature and renew, to become antifragile by adapting over time to stress. The limit on how far of a jump can be made is an attempt to mitigate the distorting effects of our existing public investments, the build-it-and-they-will-come, winner-take-all delusion we’ve come to view as normal. It’s all about feedback loops. As Tomas Sedlacek suggests, trading growth for stability. I want to help you think this through, to peer into the future and envision what I think – what I hope – would happen in such a system. In the triage that will be the next generation of cities in North America – my apologies to Ed Glaeser, Richard Florida and others – there will be neighborhoods where the pipe is fixed and others where it isn’t. Where the fire department is staffed and where it is not. How do we determine which is which? Well, of course, the pipe where the rich people live will be fixed while the pipe where the poor people live will not. Let’s pretend, however, that we truly want to avoid that outcome. Let’s pretend that in enlightened places like Portland people really do care about everyone in their community (and I believe they do, in more places than just Portland). What we should see, with my proposal (and other Strong Towns approaches), is that some neighborhoods receive a lot of incremental investment and other do not. With the high bar to development lowered – in price and in regulation – we should get a lot of Jimmy’s Pizza-scaled development. Small chaotic-but-smart stuff that seeds and reinforces a local economic ecosystem. In time, we’ll get a second generation in these places and even a third, increasing intensity in a feedback loop that mimics traditional development patterns. With each successive generation, the allowable increment climbs and so the places that people find strategic and valuable are those that will experience self-reinforcing growth. And because it’s incremental, it doesn’t displace the way our big leaps do today; a much broader share of people share in the wealth being created. And, as we like to point out with Jimmy’s Pizza, it works at a scale that is inclusive of anyone with a dream who is willing to work hard. You know, what we Americans like to believe we are (instead of what we really are today). In short, the system triages itself. In time, these places would (hopefully) become financially solvent, the cost of providing services easily justifiable by the tax base produced (not just the political influence). When we are forced to decide which pipe to maintain, which place to provide quality transit, where to maintain the best public safety response times, these are it. And you’ll not only have the math to back you up, you’ll have the critical mass of public support there as well. As for those other areas….. I do not think the core of Portland will go away, although it will have to deal with the financial drag of subsidizing the transition happening on its outskirts. The rest – the neighborhoods of single family homes that reject incremental growth or are too far away from those emerging neighborhood centers to ever experience it – will go one of two ways. Either they will wall themselves off into an affluent, yet fragile, enclave and use their political clout to try and force everyone else to continue to subsidize their preferred living arrangement. Or, their homes will go into steep decline and will eventually be used for salvage material. Either way, we need to start framing the conversation today in terms of financial productivity. We need to drop our fetish with density, our grand dreams of converting those storage sheds and 7-11’s at each ill-conceived transit stop into a mini urban utopia, and start talking about how we build – and sustain over multiple generations – enough wealth to actually afford the places we want to inhabit. Chuck, you don’t understand the level of resistance. No, I actually do. We need to stop talking about density and start talking about financial productivity. So Your Town is Building Lots of New Housing Units! But How Many New *Doorbells* Are You Losing? How is it possible that so many of our cities are seeing their footprints grow, but their populations shrink? The answer to this paradox might surprise you.